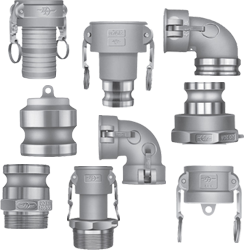 American made quick connect/disconnect couplings and replacement parts for the Petroleum, Industrial, Chemical and Food Grade markets. Quick Connect/Disconnect Couplings provide for quick connecting and disconnecting by means of the camming action. This camming action allows pipe and hose connections to be made without the need of hand tools or difficult threaded connections. Cam and groove couplings are made up of two parts, male (adapter/plug) and female (coupler/socket) that work together. The male adapter is simply inserted into the female coupler until contact is made with the gasket. Both cam arms on the coupler are then pressed down/closed simultaneously to produce a uniform gasket compression between the seal surfaces. This seal is created because the cam arms of the female coupler fit snugly against the groove of the male adapter. A positive seal requires that the surfaces on the gasket seat, the adapter face, and the gasket are smooth and uncontaminated. Also cam arms must be in the full closed position for proper locking of the coupling. To disconnect both arms must be lifted / opened simultaneously to release the seal and release the connection. Every effort is made to maintain customer satisfaction with a quality product, on time and at the lowest possible cost. As an ISO 9001 certified company, demanding quality control standards help keep our line of connect/disconnect couplings an exceptional quality.